Stained glass artisans: will your works stand the test of time in Azul: Stained Glass of Sintra? 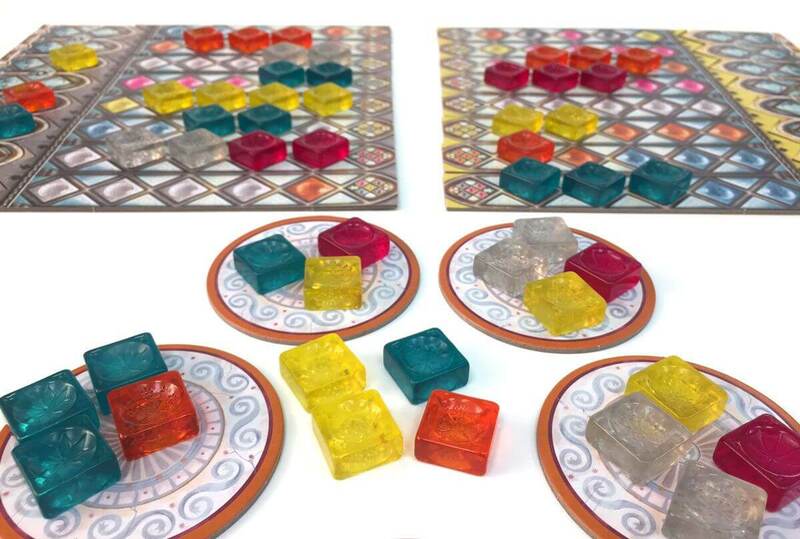 The overall thematic of Michael Kiesling’s Azul: Stained Glass of Sintra is a race against other artisans to create the most beautiful stained glass windows with which to furnish the palace of Sintra. The playthrough of the game is deceptively simple, and its overall design is reflective of the mastery that goes behind glassmaking. Azul: Stained Glass of Sintra’s simplicity and replayability has me intrigued, but what other surprises does it have in store? Players take on the role of one of the many glaziers over the realm who have come to Sintra. The task? Simple. Create a beautiful stained glass masterpiece for the Sintra palace. Along the way, players will have to learn to manage resources and avoid damaging them in the process. Blending tile drafting, pattern building, set placement, and tile placement, Azul: Stained Glass of Sintra has an average gameplay time of 30-45 minutes, making it easy for newbies to get into the game whilst still retaining its playability. 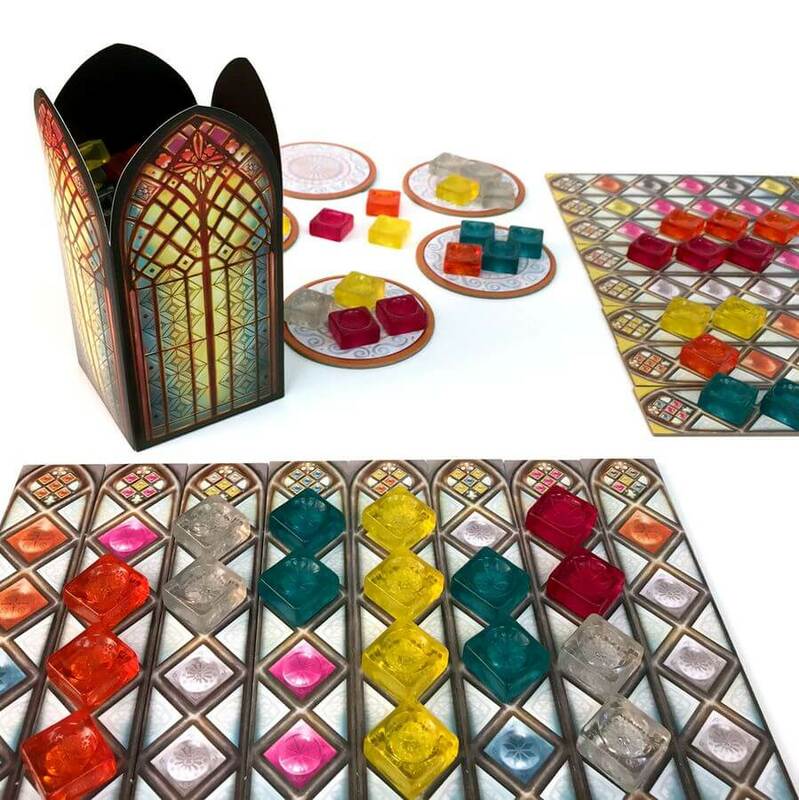 As the game progresses, players will create their patterned stained glass creations, drawing from factory displays containing the tiles needed for the work to flourish. But watch out! Drawing too many resources can also result in wastage and the eventual destruction of those resources, which then results in a deduction of scoring — up to a maximum of -18. This is reminiscent of the actual destruction of raw materials in glassmaking, and the deduction area has a shattered glass background. Despite having very little lore to run on, Azul: Stained Glass of Sintra’s art, the standing highlight of the game, makes up for it. Seamless tiled patterns are lovingly crafted into eight detachable window panes, each of double-thick card. These panes are the joined to the main glass window, also crafted from double-thick card. The meeples are functional and come in four colours for a maximum of four players. As for the tiles themselves, they reflect the beauty of stained glass and the luster and translucency of the tiles make the experience all that more memorable. The rulebook scores major points too, as it not only fits in with the thematic of the game art-wise, but whose rules are easy enough to comprehend and master. Azul: Stained Glass of Sintra’s structure is remarkably simple. In six rounds, players aim to be the one with the most points by performing actions to complete their glass panes. Firstly, all players take from the Factory displays, with the starting player tile in center. They must select a particular color and push the rest to the centre. If players were to choose the first action, they have to select all the tiles of a particular color from the Factory display or pick all the tiles of one color in the centre. 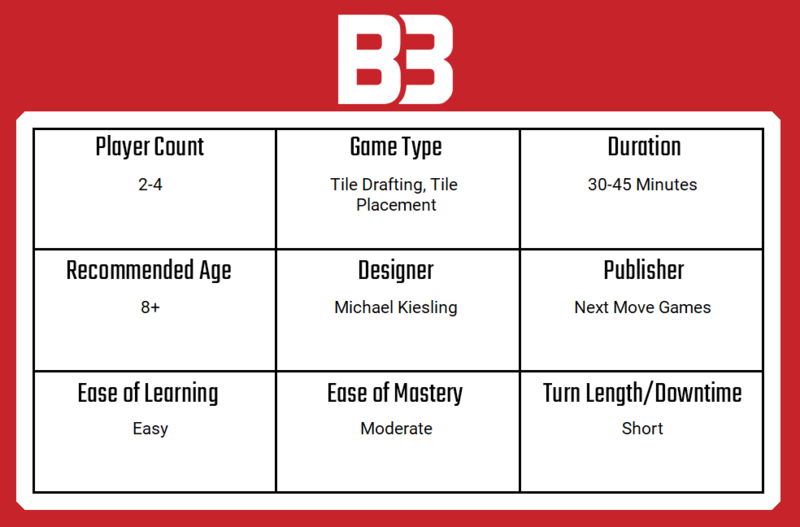 If you are the first player in this round to pick pane pieces from the center of the table, you have to take the starting player tile from the center and then place it next to your palace board. Then, have the scorer move your marker one space down on the broken glass track. Next, place them on one of the pane strips which has to be directly beneath the glazier or to his right. If you have more colored tiles than empty spaces, move your marker down one space on broken glass track for each tile that is “destroyed” and put it in into the glass tower. Lastly, check if the pattern is complete. If it is not, your turn ends. However, if you have completed the pane, you have to: check if you get color bonus points for that round. This is the proceeded by removing all the tiles except one and dropping the other four into the glass tower. The kept piece is used to “decorate” the palace window. If you have completed the top frame space, instead of flipping the pane over, you remove it completely and leave your glazier atop the empty slot. Then score as follows: gain the points printed below that window and, in addition, all the points printed below those windows to its right that contain one or two pane pieces themselves. Instead of picking any glass tiles, you “reset” your glazier to the leftmost pane, but be warned, you can’t move him atop an empty slot! There are a couple of things that I like about the game and just one minor point that I don’t. As a writer, my keenness for games is only matched by my love of rich lore and Azul: Stained Glass of Sintra’s lack of lore is a bit of a sore point for me. That being said, with a short gameplay time, there is very little to be done in terms of lore. I would have loved to see more on the realm of Sintra — Why are the palaces in need of stained glass? Is there a significance? Where do all these glaziers come from? With regards to the gameplay itself, its simplicity and fast-paced turn system has drawn me in. Most importantly, creating these beautiful works of art makes for a truly rewarding experience. I suppose if one were to consider all these elements in tandem with the rich artwork, then it makes Azul: Stained Glass of Sintra, well, Azul: Stained Glass of Sintra. 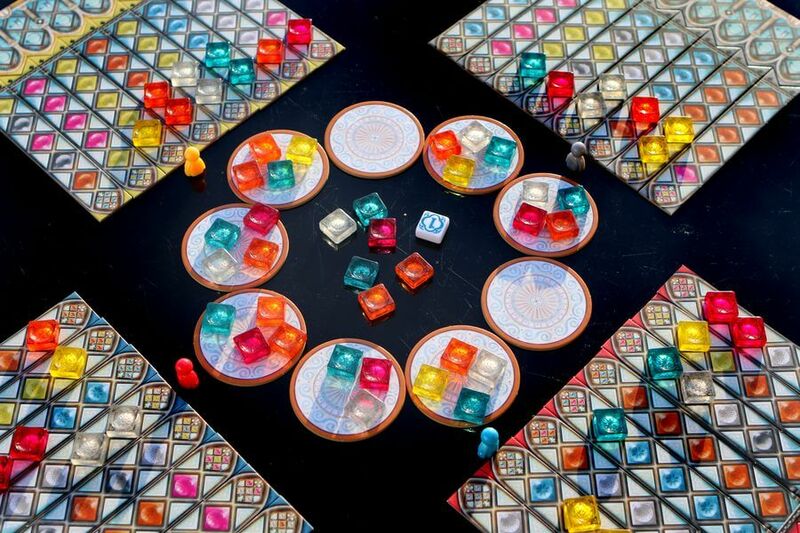 Overall, I think that Azul: Stained Glass of Sintra serves its purpose to not only entertain, but to also train the eye by ways of its stunning art and design and will always be welcome in my collection of games. The simplicity of the rules and patterns ensures that even young children will enjoy this particular game. The production quality has Azul: Stained Glass of Sintra looking perfect even in the most barren of collections, which in turn makes it a very worthwhile investment for a beginner into tabletop games. You can get Azul: Stained Glass of Sintra from Next Move’s website.